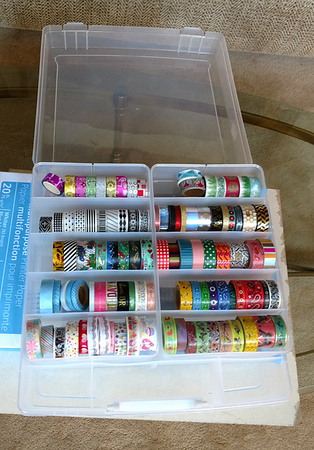 I have so much washi tape, you guys. Fortunately porkwithbones recognized this and bought me a great big container. It's so big that it can actually hold all my washi tapes in the top racks! The bottom racks are currently empty, but I think I could put stickers and stamps in there for now and keep everything in one place. Meanwhile the top racks are actually kinda-sorta organized by style! That's a first for me, but now I have the room to do it! This entry was originally posted at https://laridian.dreamwidth.org/2952514.html. Please comment there using OpenID.